Order great soft side Imprinted Six Pack Coolers from Colorado Promotion. These coolers feature a comfort carry handle and are perfect for lunches, picnics, concerts, sporting events, camping, and so much more. 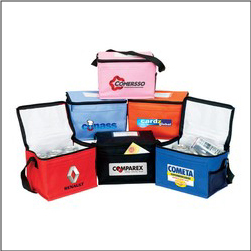 Approx 8.5″w x 6″h x 6″d – 6 can cooler bags are one of our most popular items!